When specialty coffee buyers visit coffee bean farmers, they usually want to taste the coffee for the flavor nuances, discuss price differentials, volumes, and delivery months. They don’t usually ask whether the kids are going hungry. Keurig Green Mountain, Inc. (Keurig) doesn’t want to leave that question unasked anymore. And the company is not alone. In the rolling hills of Jinotega, Nicaragua, Keurig’s Colleen Popkin, senior manager in sustainability focusing on supply chain outreach, joined peers from Starbucks, the Specialty Coffee Association of America, Farmer Brothers, Counter Culture Coffee, and Mercy Corps. Together they hiked narrow, muddy paths to a remote village where farmers have been growing some of the most exquisite coffee beans for generations. The group – by chance entirely women – represents some of the world’s biggest coffee brands and leading NGOs. Calling themselves the “Coalition for Coffee Communities,” and including companies S&D Coffee and Sustainable Harvest, they’ve been meeting regularly since 2012 to use their collective weight and expertise in a quest to make hunger in coffee-growing communities around the world a thing of the past. When they reached the village, mud on their boots, they set to work evaluating how families are faring, and whether the projects that the coalition is funding are actually making a difference to help coffee farming families deal with seasonal hunger. And if not, how do they improve upon those efforts? Knowing that farmers like those in Jinotega are struggling with seasonal hunger motivates Popkin and her peers. Many farmers in the region find their harvests are too small to support their family for a full year and are dealing with a complex intersection of climate change, weak local government, few options for financial credit, and limited agriculture extension services. It’s a set of problems too big for any one company to tackle alone. That’s why the Coalition formed, despite their competition in consumer markets back at home. “There’s so much need, and there’s not enough resources within one company to address it,” said Popkin. “Keurig tries to look at what we can do to directly support our suppliers within our own supply chain, either through our business practices or through targeted investments. Then we look for partners to extend our reach. In Nicaragua, the coalition has partnered with Mercy Corps and Aldea Global, an association of smallholder farmers launched by Mercy Corps in 1992. The association has grown substantially, today working with 2,200 farming families and 12 cooperatives, generating a loan portfolio of USD $2.4 million for its members to borrow and expand their farms and small businesses. But climate change has sped the pace of problems, spreading diseases like the dreaded “coffee leaf rust,” which has wiped out coffee trees at an alarming clip across Central America. Digging a little deeper behind the question of hunger, Popkin explained that families have begun to lose some of their traditional ways of farming, which often included food production. They’ve increased their reliance on coffee income, and on external inputs like chemical fertilizers and pesticides. Homogenizing the shade trees and varietals they plant also increases their risk. One major pest could wipe out an entire farm. Keurig’s Colleen Popkin (middle). Image credit: Keurig Green Mountain. “Organizations like Mercy Corps want to capture the value in those traditional ways of farming, like producing compost, using native tree cover and intercropping,” she said. The group is working with farmers to bring back some of those traditional practices, but with a new spin – adding an extra source of income wherever possible, like intercropping bananas and citrus trees. Keurig’s dialogue with its suppliers is truly two-way, says Popkin. Days before the visit to Aldea Global, Popkin attended one of the company’s “Intercambio” events in Guatemala, a gathering that brings together all of its suppliers from an “origin region.” At the gathering, the Keurig procurement team can discuss the growth of the company, the direction it’s headed and share updates on quality standards. Suppliers can talk through challenges they experienced during the previous harvest and share their expectations of Keurig. “Food security will still be at the heart of this work, but we’ll expand our thinking more broadly to encompass other systemic vulnerabilities and risks that coffee farming families are facing,” she said. 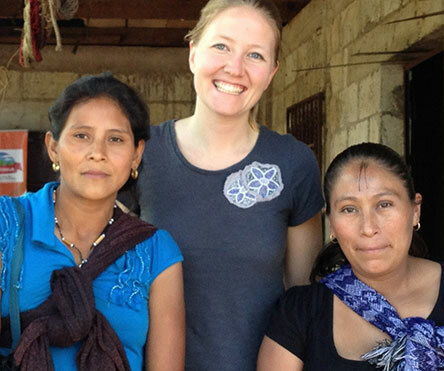 Kyla Yeoman is the program manager for Global Envision, a blog managed by Mercy Corps focused on market-based solutions to poverty, where this article was originally published.